From Victoria Embankment and Westminster Bridge to glamorous sky-high parties, there are plenty of ways to find amazing views of the world famous London New Year's Eve fireworks. 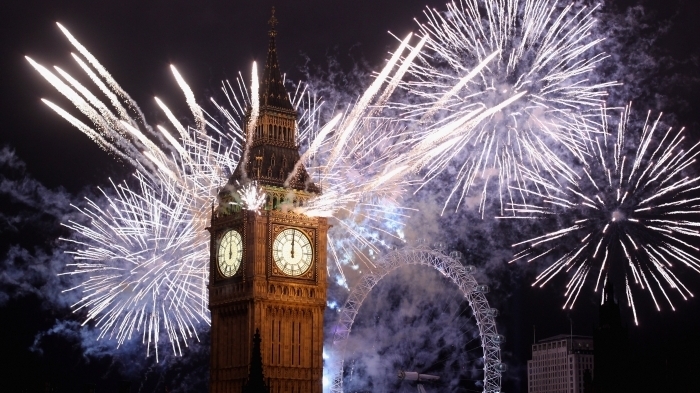 Buy a ticket in advance to ensure you get the best view of the London Mayor's fireworks. The annual New Year's Eve Fireworks display, launched from the foot of the London Eye and from rafts on the Thames, is visible from most of central London: the basic rule is that if you can see the London Eye, you'll be able to see the show. They cram enough firepower for an hour-long display into ten explosive minutes, lighting up the sky for miles around. The best views are from Victoria Embankment, the South Bank, and Westminster Bridge and Waterloo Bridge. Hungerford Bridge is closed after 8pm and there's also no entry to Westminster Bridge after this time. Watched by half a million people, in 2014 the organisers introduced ticketing for 100,000 in order to prevent overcrowding. Go to www.london.gov.uk for full details. There are also a number of non-ticketed areas where you can enjoy the fireworks from. Avoid the £10 charge and ensure you secure yourself a great spot to watch all of the fireworks set off at midnight this New Year's Eve by watching on from Cannon Street. In the midst of St Paul's Cathedral, Mansion House and Bank, it's just outside of the ticketed area but still a great central riverside location to enjoy the city scenery as London is set alight once again to celebrate the beginning of a brand new year. Further options include Tower Bridge, which is found just round the bend from ticketed areas, Southwark Bridge and Millennium Bridge, both of which are prime spots but could get busy. A further option is Parliament Hill, which will offer a distant view but have the advantage of being less crowded and boasting views of other displays across the capital. Where ever you choose to watch the display from, be sure to arrive early, be prepared to get squished and keep in mind that Cannon Street tube station may well be closed from 8pm. Book in at the Lodge on New Year's Eve and enjoy a spectacular view of the fireworks. Enjoy a five-course meal, live music and a spectacular view of the fireworks. Found on level 31 of The Shard and offering a 270-degree view of London, Aqua Shard is an obvious choice to enjoy the famous New Year's Eve fireworks. Removing the street of crowds from the equation, guests will be invited to enjoy a five-course dinner, live music and a DJ from midnight. Dinner tickets cost £395, which include the five-course meal, half a bottle of Veuve Clicquot Champagne and entertainment, or there's the option of adding three glasses of accompanying wine chosen by the sommelier for an extra £55. Celebration bar tables cost £275 per guest while bar tickets are £175 and include a glass of champagne on arrival, canapes and entertainment until 3.30am. Live music comes from The Spinettes followed by a DJ. Watch the fireworks from the hotel overlooking the London Eye. The closest hotel to the London Eye - so a Very Good Place to watch the London Fireworks - the Marriott at County Hall is a good bet for a black tie New Year's Eve party. You're greeted by a Champagne reception on arrival and there's a slap up four course meal of steak or baked monk fish pie at Gillray's Steakhouse & Bar with red and white wine for all courses. As Big Ben strikes midnight just across the river you'll toast the arrival of 2019 with a glass of Champagne on Westminster Bridge, watching the fireworks from the heart of the action. The party continues until 2am as the live band plays on. Dine on a luxe tasting menu and enjoy the view of the fireworks from the terrace of Royal Festival Hall overlooking the Thames. On the first floor of Royal Festival Hall, Skylon has fabulous views of the Thames and its Southbank terrace is the perfect vantage point to watch the midnight fireworks with a glass of champagne. The night centres on a luxe tasting menu, created by executive chef, Helena Puolakka. After enjoying your meal with family and friends, you can dance the night away to the sound of live music. Tokyo, a band with a decade of experience, playing with Dizzy Rascal, Robbie Williams and Joss Stone, is there to lift the mood with music from the 50s to the present day. Tables are available to book from 6.30pm and tickets are priced at £325 for a 5 course menu, £50 for kids for 3 courses. This glamorous party will offer spectacular views of the fireworks display. Sky Bar, located atop the iconic Millbank Tower, is hosting an extravagant New Year's Eve Party again this year, inviting Londoners to see in 2019 while enjoying a 360 degree view of the official NYE Fireworks. Guests will be treated to a champagne and canapes reception on arrival, the night will include live roaming entertainment, photo booths, DJs and live cooking stations offering up unlimited food from around the globe. London band All The Feels Collective gets you in the party mood while dancers and performance artists mingle amongst the crowd. Movies with free-flowing popcorn are on offer throughout the evening - pace yourself, this is a 12-hour party. One of the most special parts of the evening will be viewing the Lord Mayor's fireworks - you getfrom up here. If you make it to 6am you'll be treated to a luxury Champagne breakfast with smoked salmon and caviar and, if you just can't go to bed yet, your ticket also gets you into a secret after party. Admire the city from the 40th floor of London's second tallest skyscraper. Dress up in your best supper club glam outfit and head to Duck & Waffle to countdown to 2019 with the special New Year's Eve celebrations. The experience, on the 40th floor of 110 Bishopsgate, is inspired by the 1920s with a live band playing retro tunes. Guests can opt for bar or dining tickets, with the bar tickets including a welcome cocktail, a selection of canapes and entertainment with seating available on a first-come-first-served basis. There's also the option of a premium bar ticket, which includes a booth for six people. Those opting for dinner can choose between an early five course tasting menu or later six course tasting menu, both include a bottle of champagne and a post-dinner platter of canapes. Tickets for the evening range from £125 to £325 per person. NOTE: whilst the venue has fantastic views of the London skyline, it does not have direct views of the fireworks at the London Eye which will be shown on screens in the restaurant and bar. Enjoy the fireworks from a private terrace. The Chinese restaurant on level 33 of The Shard serves a five-course feast followed by a view of the fireworks. Providing 'the ultimate view of the Mayor of London's fireworks', Hutong is the perfect spot to spend New Year's Eve. The restaurant will be serving a five-course northern Chinese menu of sharing dishes, along with half a bottle of Veuve Cliquot champagne. There will be entertainment during dinner and after guests will be able to enjoy the fireworks and join the party on Level 31 in Aqua Shard, where a DJ will play until the early hours. Alternatively, guests can opt to stay at the table for after-dinner drinks. Dinner tickets are Â£345 and bar tickets are Â£120, which include a glass of champagne on arrival and a dim sum platter. See fireworks all over London from this rooftop garden party. It's disco fever at the Sky Garden this New Year's Eve as the 35th floor attraction marks the beginning of 2019 in style with a Studio 54 party. Set against a backdrop of city views and Sky Garden's luscious tropical greenery, this is the occasion to don your most stylish disco inspired attire - and party the night away to live music from a nine-piece party band as well as late-night DJs. There's the option to attend just the party or go all out and book one of the decadent dining packages in the Fenchurch Restaurant or Darwin Brasserie. Whichever one you choose, the best bit about the Sky Garden is those show-stopping city views of the city, The Shard and far beyond - the perfect backdrop for dancing all night long. This boat party has priority views of the New Year's Eve fireworks. Stopping right in front of the London Eye at midnight, the ElectronicSessions New Year's Eve Fireworks Boat Party provides the best possible view of the firework display - ten years of events offer them priority over other organisers. With two fully heated floors, tickets from 80 pounds and two bars serving drinks at generous prices - they promise no NYE hikes - it will also offer comfort and value. Guests will be treated to the best '80s, '90s, club classics and disco tracks throughout the night. Spend NYE at this rooftop bar and you're more than likely to see some fireworks. Sitting atop the Mondrian London hotel on the South Bank, the Rumpus Room offers spectacular views of the city so, despite not having a view of the official London Eye display, you can almost guarantee that you'll get to witness a firework display or two on New Year's Eve. The celebrations kick off with a champagne reception followed by an open bar all evening, which will allow guests to enjoy free flowing house wine, Heineken beer and a selection of spirits in 25ml pours. The evening will also include live music, a late-night set from the resident DJ and bacon sandwiches at 1am. From cheap budget places to stay to luxury 5 star suites see our special offers for hotels, including Le Meridien Piccadilly from 44% off.